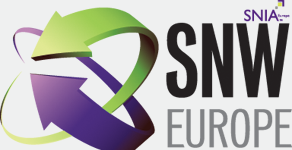 As our own Rose Ross (@Rose_at_O) blogged back in February, next Friday, April 26th is the call for papers deadline for the Storage Networking World Europe (SNW Europe), Datacenter Technologies and Virtualization World conferences. As in previous years, the event organisers are seeking “quality submissions from IT end-users, consultants, industry analysts and system integrators/VARs, describing case studies or technology update sessions that focus on real-world deployments and/or methods and best practices to evaluate new, existing or future solutions. ” More information and suggested topics are available here. If you’re busy putting together your submission, you might be interested in these tips for winning an SNW Europe speaking slot, taken from a previous Countdown2StorageExpo blog post based on a conversation with the conference programme director at the time, Paul Trowbridge: Read the rest of this entry ?